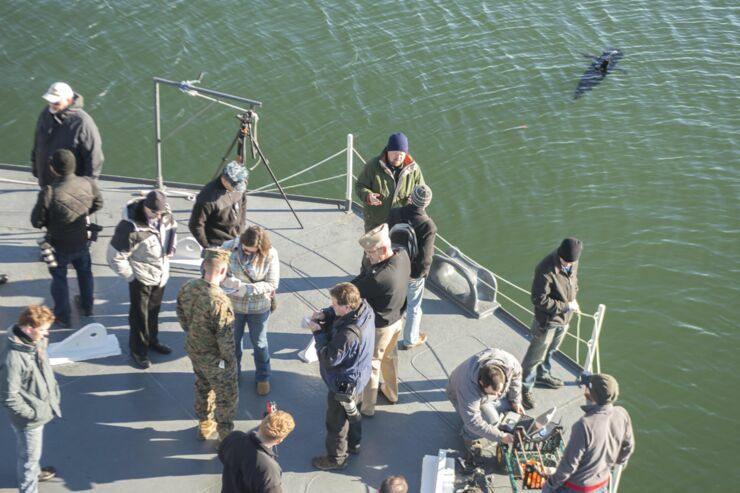 Not content with building a giant laser that can zap boats out of the water, the US Navy have been testng a new unmanned underwater vehicle (UUV) called GhostSwimmer. GhostSwimmer is part of the Chief of Naval Operations Rapid Innovation Cell (CRIC) project Silent NEMO, which develops biomimetic devices for use in their UUV fleet. 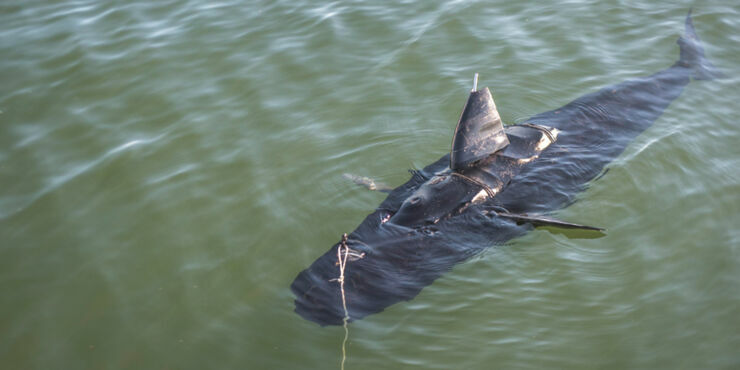 The drone was built to mimic the design and propulsion power of a tuna fish, but with its dorsal fin sticking up on its back it looks more like a shark. It measures around 5 feet long, looks like the real thing, weighs nearly 100 pounds and is operational in depths ranging from 10 inches to 300 feet. 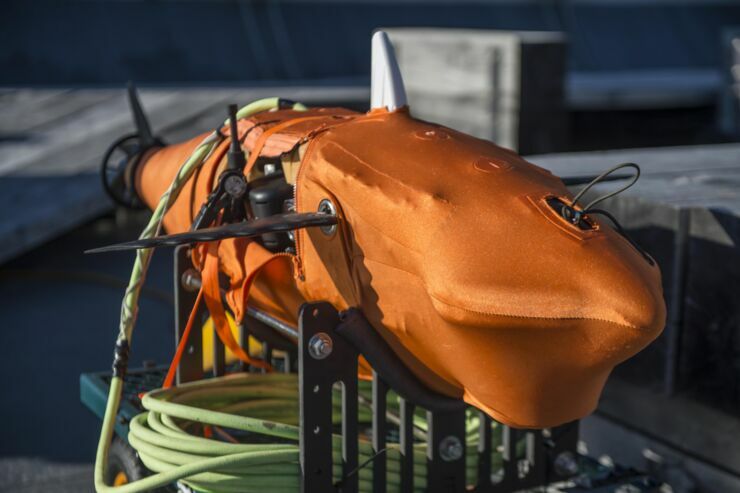 The robotic fish was developed by Boston Engineering, director of the company's Advanced Systems Group Michael Rufo says: "GhostSwimmer will allow the Navy to have success during more types of missions while keeping divers and Sailors safe. It swims just like a fish does by oscillating its tail fin back and forth. The unit is a combination of unmanned systems engineering and unique propulsion and control capabilities." Its bio-mimicry provides additional security during low visibility intelligence, surveillance and reconnaissance (ISR) missions and friendly hull inspections, while quieter than propeller driven craft of the same size, according to Navy Warfare Development Command (NWDC). The robot is capable of operating autonomously for extended periods of time due to its long-lasting battery, but it can also be controlled via laptop with a 500-foot tether. The tether is long enough to transmit information while inspecting a ship's hull, for example, but if operating independently (without a tether) the robot will have to periodically be brought to the surface to download its data. "This project and others that we are working on at the CRIC are important because we are harnessing the brainpower and talents of junior Sailors," said Capt. Jim Loper, department head for Concepts and Innovation, NWDC. "The opportunity for a young Sailor who has a good idea to get that idea heard, and to get it turned into action, is greater [now] than any other time in our Navy's history." The CRIC was established in 2012 to provide junior leaders with an opportunity to identify and rapidly field emerging technologies that address the Navy's most pressing challenges and aims to find ways to quickly employ them in the fleet. "Our mantra is 'you have permission to be creative.' We want our people to go out there and dream big dreams and put them into action," said Loper. "We want to see projects like this replicated throughout the fleet. The fusion of the deckplate brainpower with support of the most senior leadership in the Navy is going to keep us moving forward throughout the 21st century."